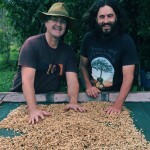 Gallery / Journal | Ewingsdale Coffee | Organically grown… Byron Bay Ewingsdale Coffee Estate is locally grown in Byron Bay and hand picked. Visiting our online store for the first time? Take a look at our Bonus pack options. The finest of Australian grown coffee, roasted fresh and easy to order online using PayPay or the manual payment option. Each bonus pack contain 3 different blends (2 x 500g & 1 x 225g packets),for you to taste and the price includes postage. Bonus packs are available in Whole beans, a fine grind (called Espresso Grind), a coarse grind (called Plunger Grind) and now a super fine grind (called AeroPress Grind). You can also save money by choosing a Coffee Lovers Selection option. This is a 2kg purchase of one variety only. Choose from the Dark Roast, Cafe Blend, Estate Blend or the Byron Blend in Whole Beans, Espresso Grind,Plunger Grind or AeroPress Grind. A drop down choice in each category will show the 2x1kg Coffee Lovers Selection Special. On filling out the purchase order form, you will receive a confirmation email from me, telling you by which method your parcel will be delivered by. If you decide to use the manual payment option, your parcel will be sent on confirmation of payment. Our coffee is roasted to order right here in Byron Bay every week, ensuring that you get the very best of Australian grown coffee delivered to your door ASAP. If you wish to only purchase a minimum of 2 x 225g bags only, call Robert on 0418 370 098 so he can arrange a special price that avoids the standard $16 postage & handling charge. Thank you for choosing us and supporting Australian farming. It really is appreciated. 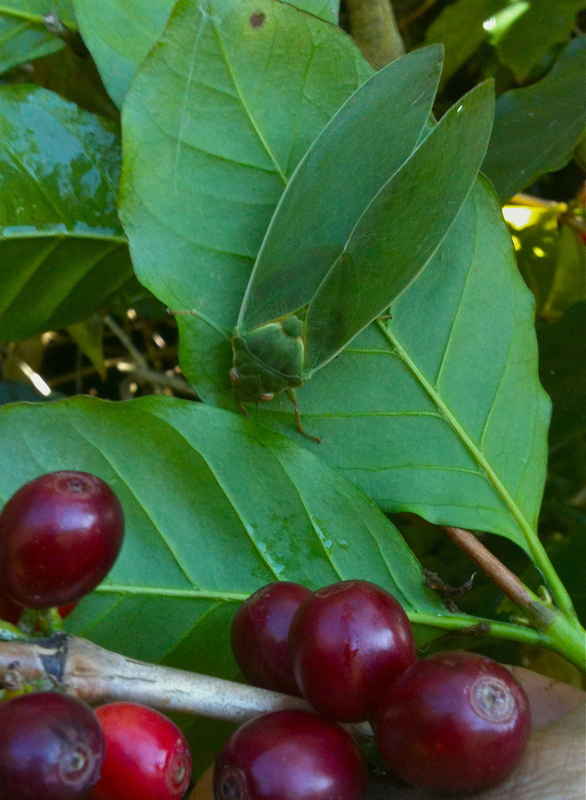 Coffee – Australian grown coffee beans, available at local markets. What we grow, we roast and sell. 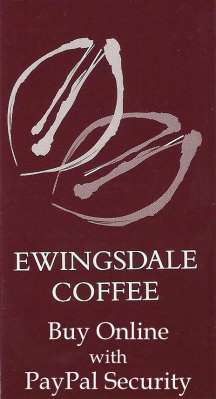 From it’s start in 1994, Ewingsdale Coffee has always maintained it’s local content. No imported coffee is used to ‘fill’ our orders. 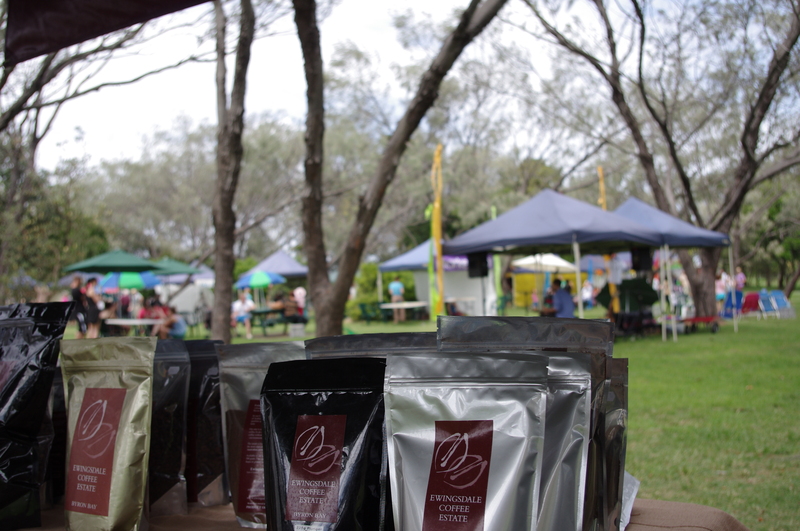 Make your way to Bangalow markets held on every 4th Sunday of each month one of the ways of buying our Australian grown and Australian owned coffee beans. These Sundays you will find freshly roasted whole beans, an espresso grind (fine) and a coarse grind for plunger use, packaged and ready to purchase. Whole beans are sold in 225g, 500g & 1 kg size packs. Espresso & Plunger Grind in 225g & 500g packs. If you are wanting 1kg packs of your favourite grind, please contact me on 0418 370 098 in advance of markets, so I can have your order ready for when you visit. You can also order for the markets by leaving a message on our Facebook page and I’ll respond ASAP. Ewingsdale Coffee’s, 100 % Australian Grown Coffee and Pomona Fruit and Vegie Market can both be found in the Noosa Hinterland. Now that’s good news. 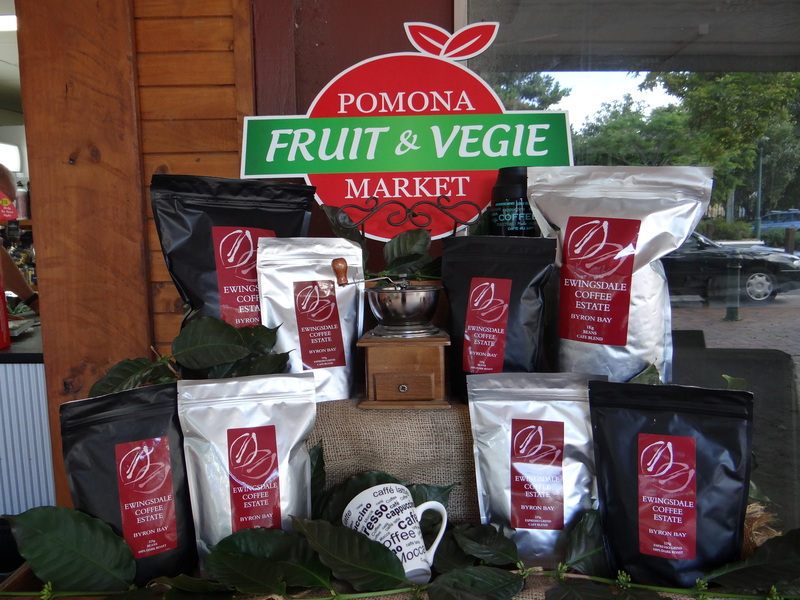 Pomona Fruit & Vegie Market is a local retail outlet in the Noosa Hinterland and now has a stock of the finest Australian grown coffee from Ewingsdale Coffee. Kay and her friendly staff have two varieties for you to buy. The Cafe Blend and the 100% Dark Roast varieties come in the handy 225g size. 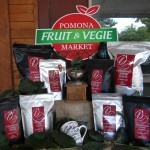 You can purchase either whole beans or a fine pre ground version that is ready to use. Kay also had the 1kg size bags in Whole beans for sale. Call ahead on (07) 5485 1922 to ensure you reserve your favourite coffee. Got through the last of my previous organic and filled the grinder with your Estate blend. I chose that one to try first as I guessed, seeing you promote that one with the bonus pack, that it was possibly your favourite?. Sensational. Absolutely beautiful, mouth-watering flavour. I am looking forward to tasting the next two! Congratulations on an amazingly good coffee.Next Email…. I had the misfortune to run out of your coffee and had to grind some beans using a mainstream coffee brand L????? ….and I nearly choked with the first mouthful. It was horrible in comparison to your coffee beans, your roast is so fresh and the taste so smooth….So THANK YOU very much for your quick delivery.Your service was fantastic as usual and your coffee was at my door first thing the next day. The only negative, is I’m drinking a lot more coffee! 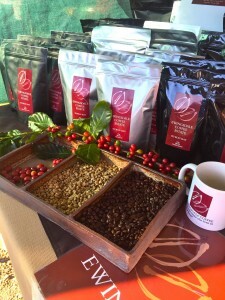 Belinda Rose CAFF ATTACK, QLD March 1st 2015 I bought some of your Coffee today at the Byron markets, so we could sample your coffee for my Mobile Cafe business… I must say, that I have tried quite a few coffees and yours was just amazing! 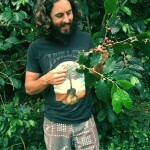 Thanks Robert – We love your coffee!! My sweet husband cant drink anything else ..
Yay- we look forward to drinking it again! Weekend markets at Bellingen, Saturday 20th Dec and Byron Bay, Sunday 21st Dec.
Ewingsdale Coffee, at this weekends markets, we will have your favourite Australian grown coffee all packed and ready to to be added to your Xmas gift hamper. 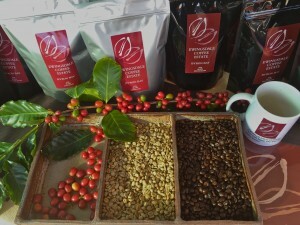 Our coffee packs range from 225g to 1kg. At Ewingsdale Coffee we like to say ” Taste the Love in Every Bean”. This weekend take advantage of our market special. You can select any 3 off our 225g packs and pay only $27, a saving of $3. With our market special it’s the perfect way you can now “Share the Love”. Our different blends of roasts are available in Whole beans. Espresso Grind – a fine grind of coffee for use in machines, stove top appliances etc. Plunger Grind – a coarse grind of coffee for use in plungers. 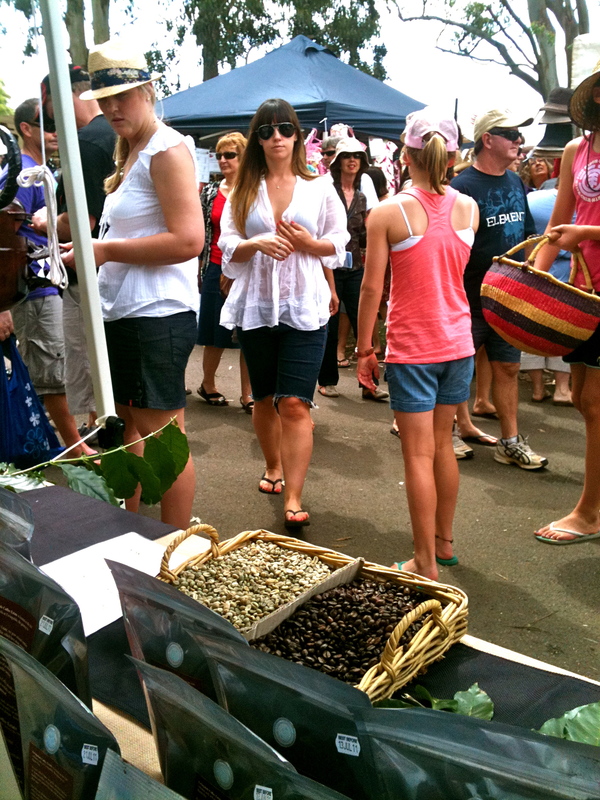 Holiday season market days are : Sunday 28th Dec, Bangalow Market. 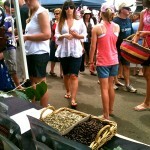 Sunday January 4th, Byron Community Markets. 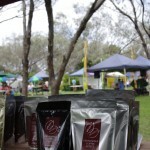 Saturday 17th Jan, Bellingen Market. Have a safe and prosperous holiday season and thank you to everyone who have supported us this year. 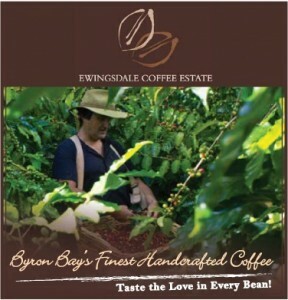 Australian grown coffee and end of season harvest at Byron Bay’s very own Ewingsdale Coffee Estate. 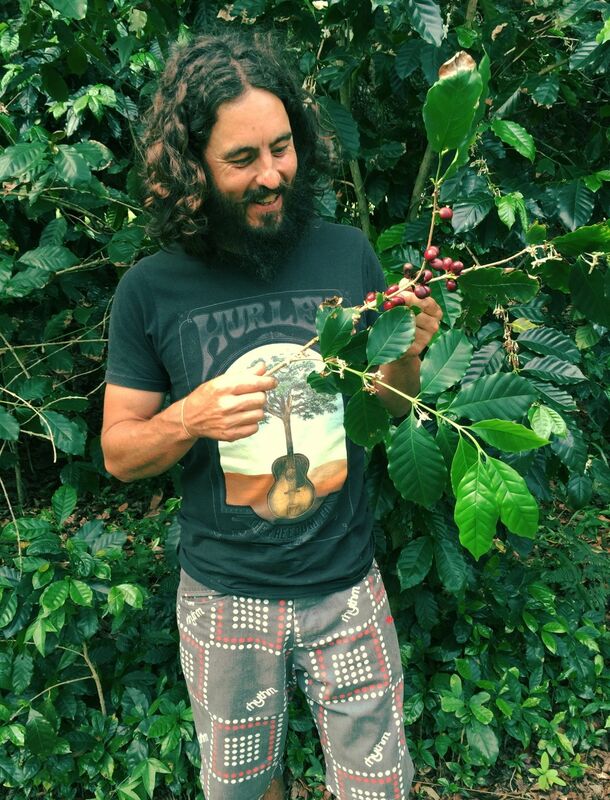 Kyle Levier lives on the South Coast of NSW at Moruya and is passionate about organic produce and Australian grown coffee. Kyle runs a coffee cart at the local Moruya market that you can visit every Tuesday afternoon. You can also catch Kyle and his coffee cart at a variety of local sporting and cultural events. Kyle has been using Ewingsdale Coffee ‘Cafe Blend’ since the inception of his business and in the last 18 months, Kyle has created a loyal following with some customers even make it a point to visit his coffee cart for their once a week coffee indulgence. Kyle and Natalie really are particular when it comes to producing a quality brew and if the crema is not right, they will start again to ensure each cup served is of the highest quality. 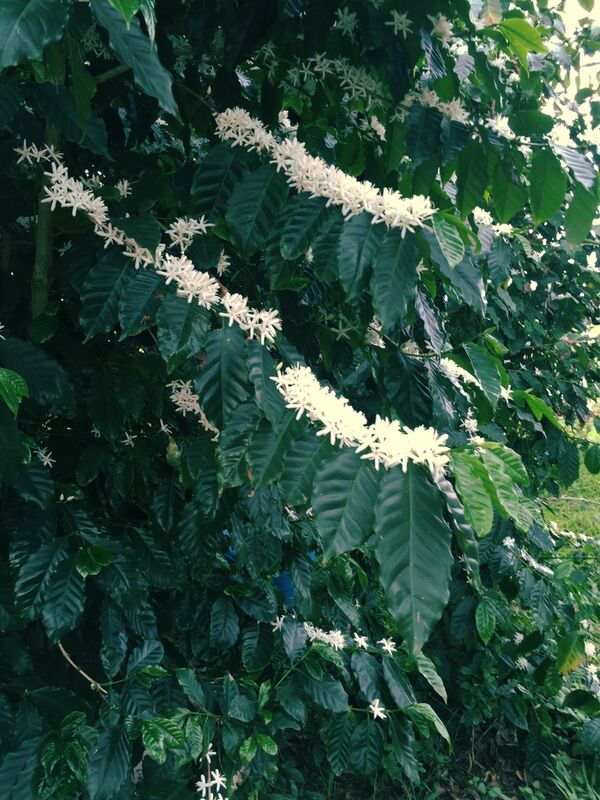 Kyle, while visiting Byron Bay, took the opportunity to visit Ewingsale Coffee Estate recently and managed to see the late harvest fruit on display, the coffee beans (after being pulped, fermented in rain water), laid out on our drying beds and even the flowering of the coffee trees. Ripe berries of the Coffee variety. The recent rains in Byron Bay had led to a strong flowering on our trees, a good indication that next years harvest will be fruitful. Kyle and friends certainly choose a great time to visit. The plantation is open to visitation by appointment only. Please ring me to ensure that I can be available to show you through. 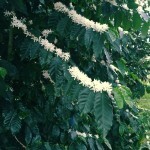 Robert / Ewingsdale Coffee / Taste the Love in Every Bean! This one’s for the Byron locals to take heed of. 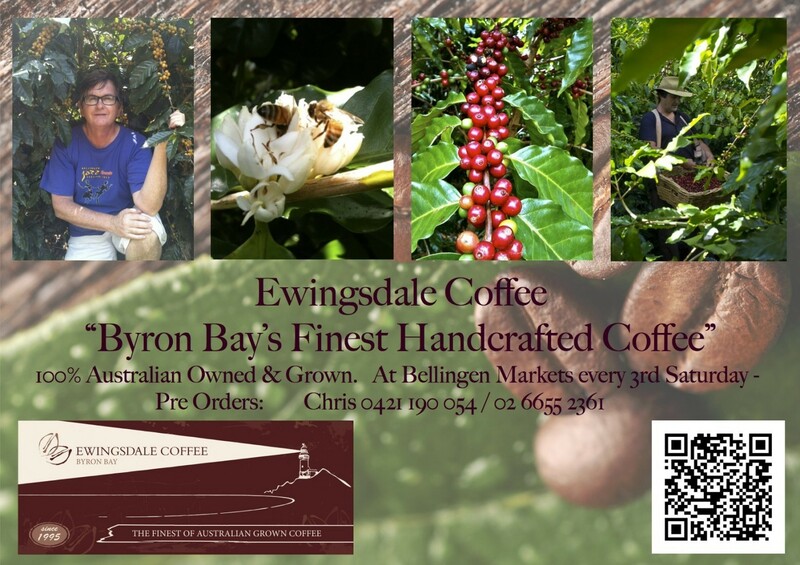 I came here to meet with a Byron Bay coffee grower that I was featuring in last week’s issue (Ewingsdale Coffee). Robert Frater prefers to share the love of his coffee blends with locals and his recommendation to meet at Soul Bowl opposite the Surf Club in Byron Bay was probably a shameless plug for his own coffee, but I can’t blame him for that – it’s on sale here and it’s a good brew. A meal made from ‘super foods’ like quinoa, goji berries and kale, can be cheaper than the price you’d pay for the individual ingredients, particularly on Mondays. 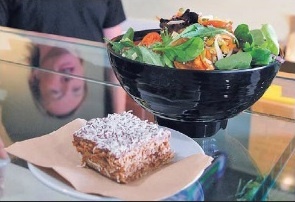 This super salad (photo Lf), is normally $13, but on Monday when everything is $8.50, it’s doubly a treat for these three wised up travellers (photo Rt) and now one wised-up writer. 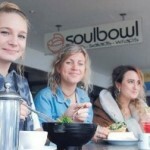 Ewingsdale Coffee & Byron Bay's Soul Bowl.. A harmonious blend! 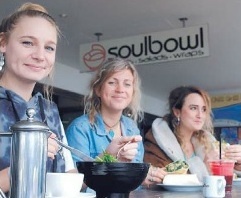 At the Soul Bowl, it’s a casual affair, with healthy fresh produce and ingredients and without too much handling, fluffing about or travelling. 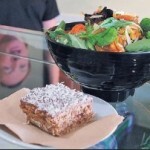 Juices, wraps of fresh fillings, baked potatoes and freshly made muesli bars – enjoy! Robert Frater is the owner of this very local brand. With 3,000 well-established coffee trees and another 1,000 to be planted in spring this year, he’s not shying away from the task of moving his coffee upward. Using organic principles and a ‘spray-free’ environment for his plantation, his blends are as close to clean green as you can get. 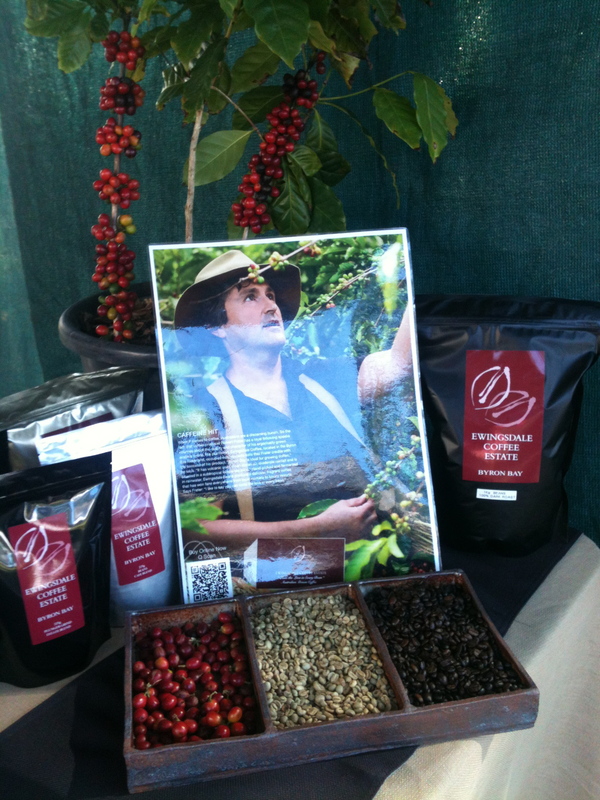 Australian grown coffee beans on show. A no-nonsense, hands-on sort of guy, you’ll find Rob talking-up all things coffee at his stall, every Bangalow Community Market.He sells his small coffee plantation coffee with all the gusto of his larger competitors and he doesn’t appear too concerned about their market share. ‘I don’t care about my market share, there’s plenty of demand and I’m doing all I can to fill my own’, he told me. Ewingsdale Coffee grows the beans and supports other smaller micro-farmers by buying as much as he can to supplement his own supply of beans. They don’t roast though, that’s taken care of by the Bun Coffee roasters down the road. It’s a lovely thing when people can work together in harmony and still be in competition. The way Australians drink coffee, they all need to be producing as much as possible. Try this brew at either Mullum Mac, Station St in Mullumbimby, or the Soul Bowl, 2/14 Bay St (opposite the Surf Club) Byron Bay. Australian grown coffee beans,Ewingsdale Coffee at Byron Bay. where Chris has ‘tastings’ of a variety of our blends. 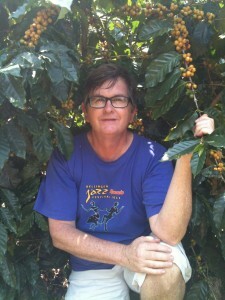 This year Chris is helping again to harvest the coffee here in Byron Bay. At Ewingsdale our Australian grown coffee beans are hand picked, fermented in rainwater and sun dried. So visit Chris every 3rd Sat of each month and grab a bag of Australian coffee beans, or pre ground for plungers (coarse) or a finer grind (espresso)Discovery Ewingsdale Coffee and, ‘Taste the Love’! — at Ewingsdale Coffee Estate. 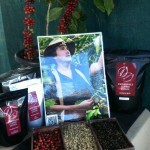 Ewingsdale Coffee Estate is locally grown in Byron Bay and hand picked. Starting August 5th, Our local newspaper (Echo) is having a weekly lift out section, called The Good Life. Written by Matthew Michaelis, it’s focus will be on food, wine and travel. In the next few weeks, Matthew will be showcasing, local coffee growers, roasters and a few select cafe’s. 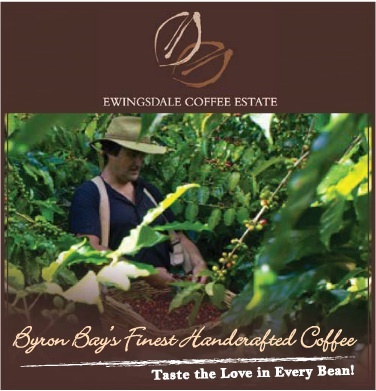 Ewingsdale Coffee is one of many local coffee growers in the region of Byron Bay. 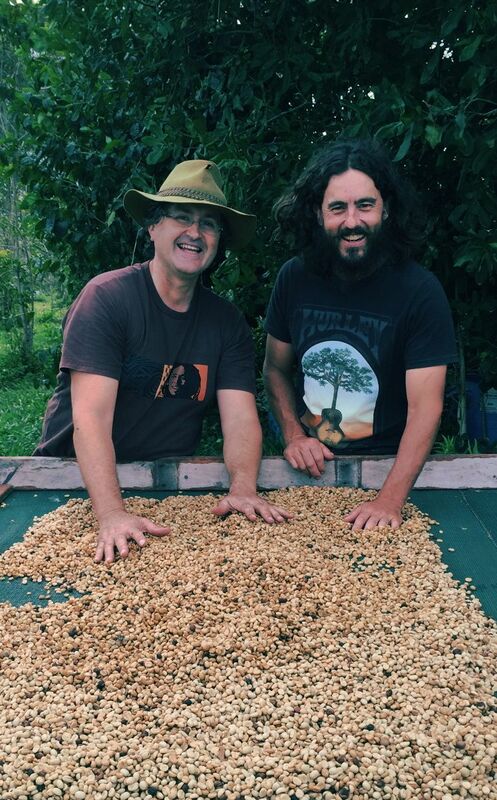 From the harvest to the roasted bean, Ewingsdale Coffee is proud to produce 100% Australian grown coffee. You too can discover why more and more people are “Tasting the Love in Every Bean” Buy online … our Bonus pack option is available if you want to try a few different blends, before settling on your favourite one.